~* West End Designs Journal *~: Knitting - The Tiny Things! Knitting - The Tiny Things! 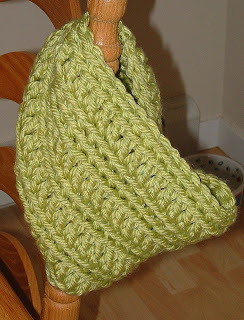 I had been looking for a bulky cowl pattern I have liked for some time now. This was perfect! Easy pattern, it was done in about an hour. It would make a great gift! The yarn, even though it is acrylic is really NICE and it is soft!!! Lion Brand seems to have come a LONG way from the days of "fun fur"!! I think I might make a few of these for gifts!! 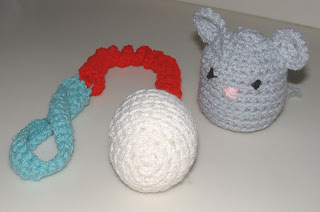 One of my friends brought home a new kitty (Welcome Chloe) and I whipped these out in a few hours (it took me longer to put them together than to crochet them!). They were fun and I think I will make some more! I added a bell in the stuffing of each toy for some interest. Another easy project and environmentally friendly too. 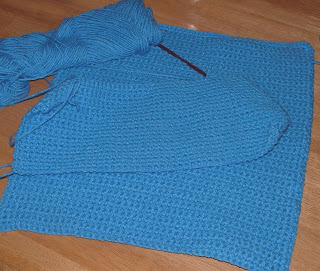 I did make the top portions in plain ol garter stitch as opposedto the "pattern" for a bit of sturdiness!! !Happiness is a dog hair free floor and no more spending $$ on disposable cloths. 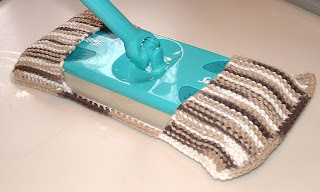 This would make a cute shower gift along with a Swiffer!! This is a MYSTERY PATTERN!!! Look for the finished photos soon and maybe a pattern!! !